Santa Claus visits Keystone twelve times during December, providing plenty of time to get those Christmas lists submitted and say “Hi” to the big guy. Various dates and locations throughout December. Keystone’s season-long Kidtopia programming begins with the grand opening of the Kidtopia Snow Fort, the world’s largest snow fort. Ribbon cutting at 12:30 p.m. on Saturday, Dec. 13 atop Dercum Mountain. Keystone Executive Pastry Chef Ned Archibald utilizes 8,000 pounds of imported chocolate for the Keystone Chocolate Village, complete with various winter scenes. Free to attend, located in the Keystone Lodge and Spa from Dec. 19, 2014-Jan. 4, 2015. Delay the après with Colorado’s longest ski day as Keystone provides 11.5-hours of skiing and snowboarding fun. Dec. 5-6, 12-13, and 19-31 Keystone is open from 8:30 a.m. until 8 p.m. Skip the cooking, cleaning and preparation needed for hosting a Christmas dinner and enjoy a delicious meal at one of Keystone’s signature restaurants. On Thursday, Dec. 25, the Alpenglow Stube, Der Fondue Chessel, Dinner Sleigh Ride, Keystone Ranch, Ski Tip Lodge and Bighorn Bistro & Bar all offer a Christmas menu. Reservations are required, 800-354-4386. Live music, dining specials and fireworks are some of the great ways families can celebrate New Year’s Eve at Keystone. There is skiing and riding to be had too of course, guests can enjoy the slopes until 8 p.m. on New Year’s Eve and begin New Year’s Day with first chair at 8:30 a.m.
Bighorn Bistro’s new family brunch provides kids and adults their very own buffets. Children will enjoy games, entertainment and a fun atmosphere with free supervision provided, while next door adults will enjoy a classic brunch including mimosas and a bloody-mary bar. Located in the Keystone Lodge and Spa on Dec. 7, 14, 21 and 28 from 8:30 a.m.-12:30 p.m. Okay, not really. But during the 12 Days of Keystone guests can win prizes such as a season pass, snow cat tour, lift tickets and Keystone swag by posting ‘countdown’ photos to Instagram and tagging @Keystone_resort. Winners will be chosen daily from Dec. 1-12. Keystone’s Ski and Ride School will provide complimentary one hour clinics for first-timers or guests looking to hone their skiing or riding skills. Two-days, two-clinics – skiing or snowboarding, offered Dec. 13-14 at 11 a.m. and 3 p.m. atop Dercum Mountain during Get to Know Keystone Days. December provides excellent early-season skiing and riding conditions, with access from all three of Keystone’s mountains; Dercum, North Peak and The Outback. “Keller & His Compadres” will be performing at Warren Station Dec. 19-20; doors open at 8 p.m. Keller Williams will also perform a solo set each evening. More information and tickets available at warrenstation.com. Ripperoo’s Village parades, Starquest and Fireworks round out an eventful December at Keystone. Ripperoo’s Village Parade – featuring Keystone mascot Ripperoo and friends at 4 p.m. in River Run Village on Dec. 13, 20 and 27. Starquest – Keystone Science School provides a unique exploration of the universe. Free to attend, meets at Kidtopia Headquarters in River Run at 5:30 p.m. on Dec. 5, 12, 19 and 26. Fireworks – free firework display visible from River Run and Lakeside Villages at 7 p.m. on Dec. 13, 20 and 27. Bigfoot Adventure Walks – A free adventure-filled nature walk. Meets at 6 p.m. on Dec. 13, 16, 20, 23, 27 and 30 at Kidtopia Headquarters. It was 80 degrees on a sunny, breezy July day at Keystone Resort as Jessica, Lisabeth and Brendon Samuelson — ages 10, 8 and 5, respectively — used chalk to draw dogs and cats on the sidewalk in the gondola plaza play area at Keystone Resort. The Denver-based Samuelsons were in Keystone for the Kidtopia Kidfest event, but they have every intention of returning for their fifth winter as a family that skis Keystone. Keystone’s Kids Ski Free program is slightly different from other ski areas in that it’s tied to lodging rather than adult lift tickets — kids get a free lift ticket for all of their stay starting the night of arrival, as long as the family stays a minimum of two nights, no other strings attached. Last season, the resort says it gave away more than 25,000 free tickets for kids (www.keystoneresort.com/kidsskifree). 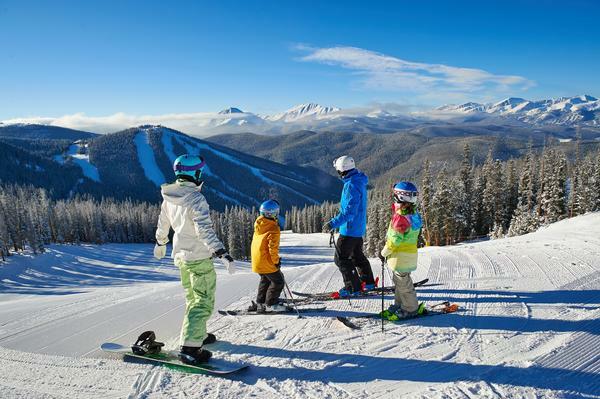 It’s just one of many family-friendly amenities at this resort — the largest in Summit County, with 3,148 skiable acres — that sits 90 minutes from the Denver area. 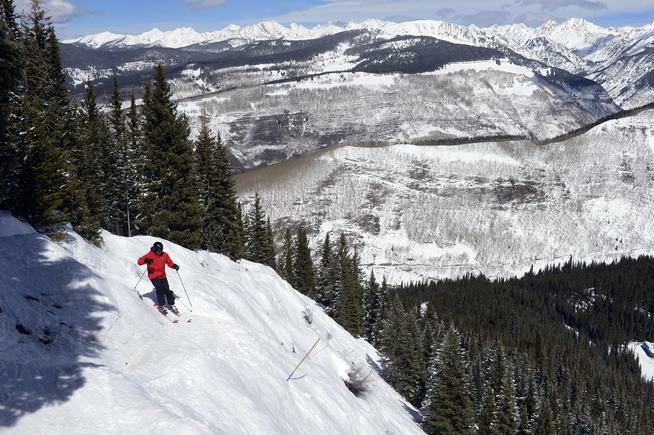 As with so many Colorado resorts, Keystone, which turns 43 next month, was originally a logging and mining concern; it took its name from Keystone Mountain itself. Founder Max Dercum, who died in 2011, has a mountain named after him; he and his partner, Bill Bergman, who has Bergman Bowl as a namesake, were adamant that trails and lifts be named after the area’s rich history — famous runs such as Flying Dutchman, Wild Irishman and Paymaster take after mines; Saw Whiskers, Ball Hooter and Go Devil are logging terms. Current owner/operator Vail Resorts took over in 1997, when Keystone and Breckenridge merged with Vail and Beaver Creek. 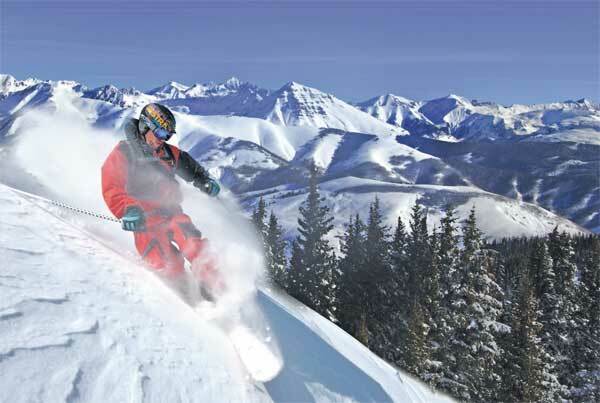 Vail was vocal from the start about its intentions to make Keystone the most family-friendly resort in the country. Over the years, while other ski areas put their capital improvement funds into higher-speed gondolas and glading terrain, Keystone focused on the family, adding a weekly parade led by a professional float, building an enormous snow fort and snow maze at the top of Dercum Mountain, increasing the wagon fleet and, this year, adding golf carts to transport guests from the free parking lot, which also offers three rows of designated high-occupancy vehicle-only parking to get families to the mountain faster and more easily. This year’s improvements include a new ski trail called the SchoolYard, designed to entice families to progress together as skiers and snowboarders in a fun atmosphere. The SchoolYard — which debuts when the resort opens Nov. 1 — has a signed entrance halfway down longtime green cruiser favorite Schoolmarm and will feature rollers, small moguls and other varied terrain. Other changes this season are more subtle but intended to tweak concepts that were already in place, such as the renaming of the terrain park Freda’s Incubator, a small area near the SchoolYard for beginner or practicing riders and skiers looking to improve their skills. This year, the park will be called Easy Street, and like SchoolYard, the goal for the area is to encourage progression and practice.